Leather Safari chair and ottoman. Beautiful leather work and patina from aging. Ottoman measures 16.5" H (same as seat height). 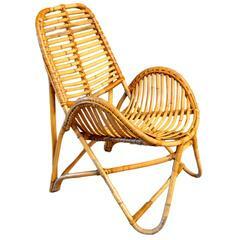 Adorable miniature French rattan and bamboo scoop chair. Perfect for a children's room. Excellent vintage condition. 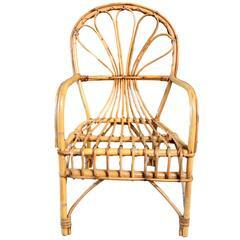 Sculptural French bamboo and rattan chair. Great lines and shape. Very comfortable. Excellent vintage condition. Perfect standalone chair. 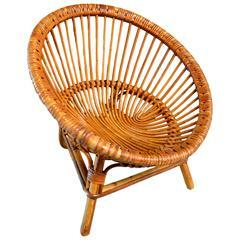 Small French sculptural rattan and bamboo children's chair Great lines and design. 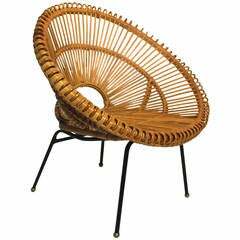 Perfect side chair for a kid's room. Excellent vintage condition..